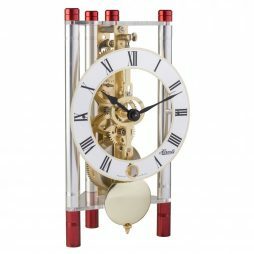 Elegant table clock with 8-day spring driven movement out of polished brass platines, 11 jewel deadbeat swiss escapement, 4 ruby bearings, 2 bronze chatons, and escapement on the front platine visible due to opening on dial. Glass case on walnut base. Dimensions: 7 x 5.5 x 4.5 inches. Elegant table clock with 8-day spring driven movement out of polished brass platines, 11 jewel deadbeat swiss escapement, 4 ruby bearings, 2 bronze chatons, and escapement on the front platine visible due to opening on dial. Glass case on red base. Dimensions: 7 x 5.5 x 4.5 inches. Made in Germany. Dimensions: 12 x 8.5 x 5.5 inches. New Hermle table clock. 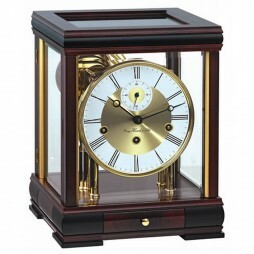 The minimalistic cubic form of this clock qualifies it perfectly for a detached positioning in an open room. The particular of the wooden, piano-finish red base is the polished metal inlay. The dial is made of polished brass with a modern Arabic number print. 8-day mechanical movement. Chimes Westminster on 4 polished bells. Dimensions: 6.7 x6.7 x 8.3 inches. Made in Germany. New Hermle table clock. 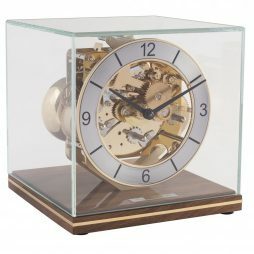 The minimalistic cubic form of this clock qualifies it perfectly for a detached positioning in an open room. The particular of the wooden, piano-finish black base is the polished metal inlay. The dial is made of polished brass with a modern Arabic number print. 8-day mechanical movement. Chimes Westminster on 4 polished bells. Dimensions: 6.7 x6.7 x 8.3 inches. Made in Germany. New Hermle table clock. The minimalistic cubic form of this clock qualifies it perfectly for a detached positioning in an open room. The particular of the wooden, piano-finish maple base is the polished metal inlay. The dial is made of polished brass with a modern Arabic number print. 8-day mechanical movement. Chimes Westminster on 4 polished bells. Dimensions: 6.7 x6.7 x 8.3 inches. Made in Germany. New Hermle table clock. The minimalistic cubic form of this clock qualifies it perfectly for a detached positioning in an open room. The particular of the wooden, piano-finish walnut base is the polished metal inlay. The dial is made of polished brass with a modern Arabic number print. 8-day mechanical movement. Chimes Westminster on 4 polished bells. Dimensions: 6.7 x6.7 x 8.3 inches. Made in Germany. 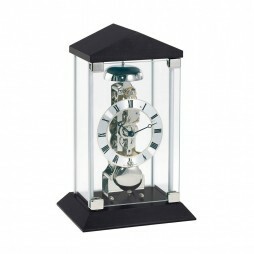 Contemporary table clock in a black wood-glass combination, with nickel plated movement. Mechanical skeleton movement, 14 day power reserve and passing bell strike on the hour. Dimensions: 12 x 8 x 6 inches. The new Tellurium Astro is a real design masterpiece which combines modern and classic in a particular futuristic form. A milled rosette rondeau that shows the 12 printed zodiac signs of the month and the date gives a fascinating view into the world of astronomy. Especially distinguished is the special turned dial with a see through to the movement, which seems to float in a glass cube. The design piece reproduces the annual orbit of the earth around the sun, with the earth rotating around its own axis once in 24 hours. The moon, in turn, revolves around the earth in 29.5 days completing a full rotation around its axis. This allows the reproduction of the different moon phases as they are visible from earth. In the course of one year, the earth passes all 12 zodiac signs, months and individual days which are indicated on the flat disc. 8-day spring wound movement with 4/4 Westminster chime on 4 polished bells. Separate second feature, 11 jewel deadbeat Swiss escapement with automatic night shutoff. The Tellurium has reproductions of the sun, earth and moon, incorporating the day/month indicator. Dimensions: 15 x 13 x 13 inches. Made in Germany. 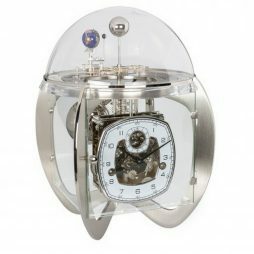 The Astro tellurium clock reproduces the annual orbit of the earth around the sun, with the earth rotating around its own axis once in 24 hours. 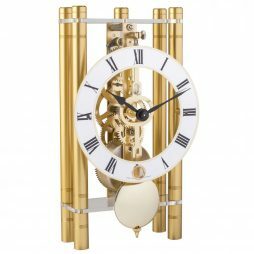 In this modern design, the movement seems to float within the brass frame. A milled rosette rondeau shows the 12 printed signs of the zodiac on a special turned dial. Arabic numerals. 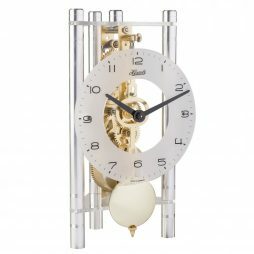 This unique timepiece also features an 8-day spring wound movement; 4/4 Westminster chime on 4 polished bells; 11 jewel deadbeat Swiss escapement; and automatic night shut-off. Dimensions: 15 x 13 x 13 inches. Made in Germany. 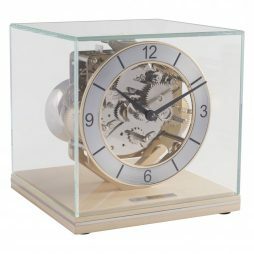 Modern tabletop clock with aluminum pillars and a mechanical 8-day time only movement. Dimensions: 7.5 x 4.5 x 2.5 inches. Made in Germany. 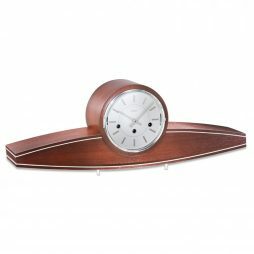 Contemporary designed table clock with aluminum pillars and a mechanical 8-day time only movement. Dimensions: 7.5 x 4.5 x 2.5 inches. Made in Germany. 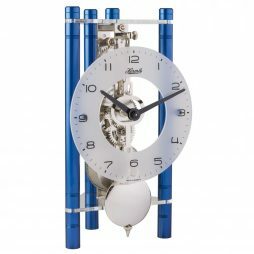 Puristic design table clock with eloxed aluminum pillars and mechanical 8-day skeleton movement. Dimensions: 7.5 x 4.5 x 2.5 inches. Made in Germany. Triangular table clock with aluminum pillars and an 8-day mechanical time only movement. Silver with glass dial, Arabic numerals and silver pendulum. Dimensions: 7.7 x 4.3 x 3.5 inches. 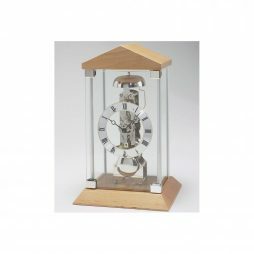 Triangular table clock with aluminum pillars and an 8-day mechanical time only movement. Blue with glass dial, Arabic numerals and silver pendulum. Dimensions: 7.7 x 4.3 x 3.5 inches. Triangular table clock with aluminum pillars and an 8-day mechanical time only movement. 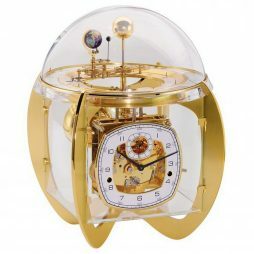 Gold with glass dial, Arabic numerals and silver pendulum. Dimensions: 7.7 x 4.3 x 3.5 inches. Triangular table clock with aluminum pillars and an 8-day mechanical time only movement. 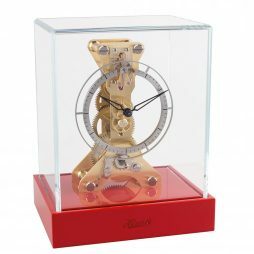 Red with glass dial, Arabic numerals and silver pendulum. Dimensions: 7.7 x 4.3 x 3.5 inches. Triangular table clock with aluminum pillars and an 8-day mechanical time only movement. Silver with metal dial, Arabic numerals and silver pendulum. Dimensions: 7.7 x 4.3 x 3.5 inches. Triangular table clock with aluminum pillars and an 8-day mechanical time only movement. 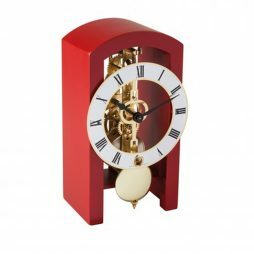 Red and Silver with metal dial, Roman numerals and brass pendulum. Dimensions: 7.7 x 4.3 x 3.5 inches. Triangular table clock with aluminum pillars and an 8-day mechanical time only movement. Silver with glass dial, Arabic numerals and brass pendulum. Dimensions: 7.7 x 4.3 x 3.5 inches. Triangular table clock with aluminum pillars and an 8-day mechanical time only movement. Silver and blue with glass dial, Arabic numerals and silver pendulum. Dimensions: 7.7 x 4.3 x 3.5 inches. 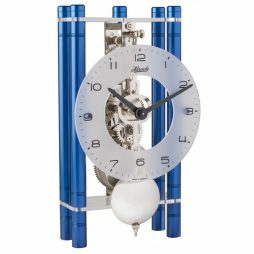 Triangular table clock with aluminum pillars and an 8-day mechanical time only movement. Silver with metal dial, Roman numerals and silver pendulum. Dimensions: 7.7 x 4.3 x 3.5 inches. 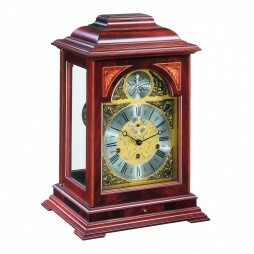 This carriage clock is an exquisite timepiece and an example of the finest cabinetry displaying a high-grade cal. NDT01 mechanism with visible Tourbillon escapement. A Kieninger original! The Akkurano is an exquisite timepiece and an example of the finest clockmaking available. The UFO is inspired both by Art Deco and cool retro Sci-Fi styling. The winding key compartment even pops down like a flying saucers hatch. You can choose between three traditional chiming melodies to play every quarter hour. The three-train movement will also strike the hour on the hour  all on tuned steel rods. 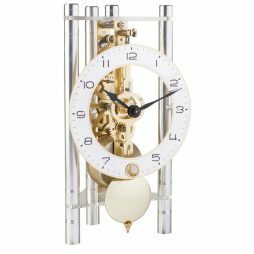 The captivating house hold item also comes with an 8-day brass movement which plays Westminster chimes and an auto night shut off. The beauty that can be found in colors which contrast with each other while providing a perfect harmony comes with a magic that is all its own. 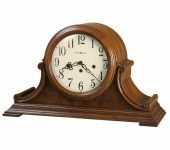 And it is for that reason that the Hermle Bergamo Mantel Clock (Mahogany) will be instantly noticeable in any setting it is placed in. The allure of its deep brown and black case enables its brass face and support to stand out, while also enhancing its bezelled chapter ring and the Roman numerals inscribed on it. Exquisite, enchanting, captivating. These three words can only be used to describe a household item capable of adding its own unique radiance to your home. Its handcrafted mahogany case in a rich reddish brown features a curl veneer and marquetry which add to its appeal as well as glass panels at its sides. 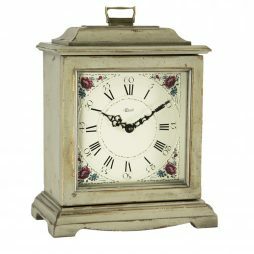 Its silver clock face surrounded by golden inlays is immediately noticeable. This skillfully decorated household item has also been fitted with an 8-day spring wound movement and an 11 jewel deadbeat escapement. 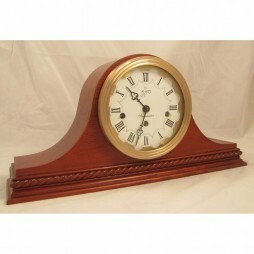 The Hermle Barkingside Mantel Clock is the perfect ornament for any room decorated in a contemporary style. 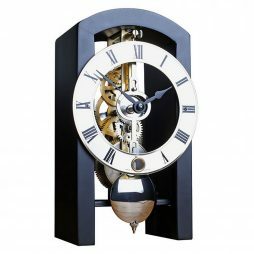 The black base and apex of its beveled crystal glass frame as well as the silvery chrome of its gear mechanism and pendulum will further add to the modern glamour of its surroundings while its white clock face inscribed with Roman numerals will complete the delightful effect. 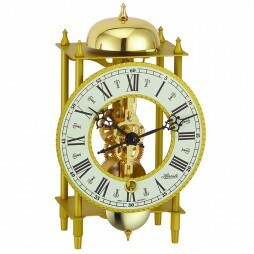 Enliven your favorite room with the golden glamour of the Hermle Wrought Iron Table Clock with Skeleton Movement (Gold). 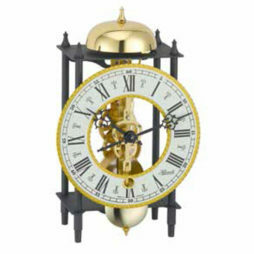 With the enthralling radiance of its wrought iron frame in a golden finish, further enhanced by its polished bell and gold edged dial, this ornate household item is both enthralling and magical. Its hollow face permits a view of its gear system in gleaming brass, while black Roman numerals and stylized hands stand out against the ensemble to create a captivating effect. 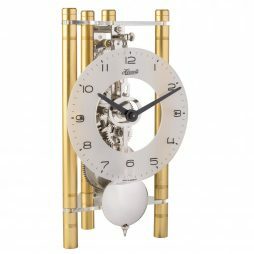 This glamorous clock has also been designed with a pendulum and a mechanical 8-day passing bell strike movement. 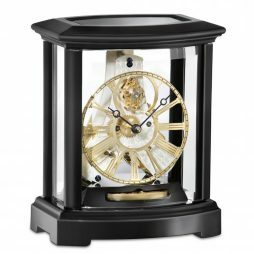 Few color combinations are capable of making a statement like black and gold and thanks to the Hermle Wrought Iron Table Clock , you too can add the glamour of this unique color pair to your home. 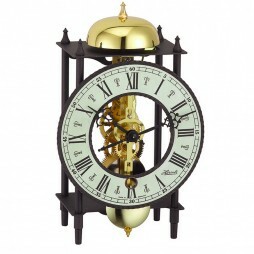 Made in Germany, this interesting clock is brought to you in an antique black wrought iron case, the clock also features a pendulum and a gold edged chapter ring above which a brass bell is visible. The hollow center of the chapter ring also permits a view of the clock’s intricate gear system. At the top of the hour, the hammer strikes the bell, to remind you of the passing time. The 8-day movement means you only have to wind the clock, with the included winding key, once a week. Invite a sophistication and inventiveness evocative of the 17th century right into the present. 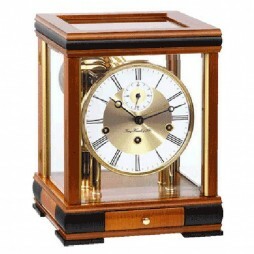 The very embodiment of one of the most important eras in clock making, the Hermle Wrought Iron Table Clock (Black-Black) is immediately noticeable thanks to its black wrought iron case which serves to highlight its brass bell and pendulum. The handworked metal frame also contrasts with the black edged chapter ring inscribed with Roman numerals through which the clock?s highly polished gear mechanism can be seen. Inventions come and go. Some withstand the test of time, remaining relevant for decades. Others are quickly shelved once the current trend shifts and they no longer serve a necessary purpose. Society is fickle that way. 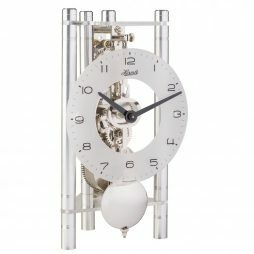 The innovative design of the mechanical clock, however, is practically in its own category. An idea that’s remained a fixture in our world for centuries, mechanical clocks were the predecessors of many related timekeeping concepts in later eras. 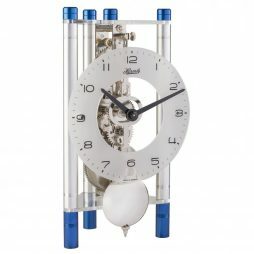 Derived as a new technique after the use of the water clock, mechanical methods have become the classic template for most clocks to this day. Sure, the inclusion of digital options are now available, too. But their arrival still did not destroy the high demand for quality, mechanical timepieces. People continue to seek them out, day after day. Here at Expressions of Time, we understand the appreciation for the intricate inner workings of mechanical models. 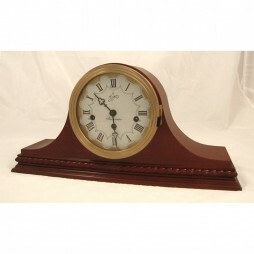 For that reason, we’ve selected a wide array of mechanical clocks suited for a variety of customers. 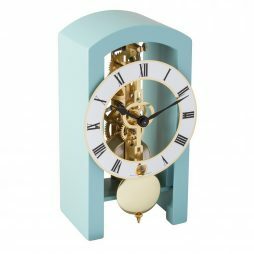 Covering an assortment of styles with different colors and shapes, we have a multitude of beautiful timekeepers to meet the standards of any home decor. So what are you waiting for? 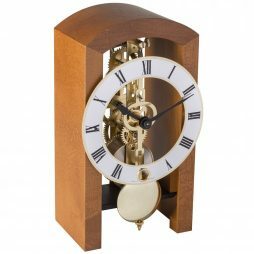 Get to shopping, and fill your living spaces with elegant clocks from ClockShops.com! 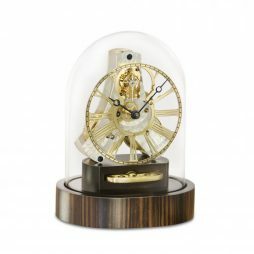 Our Collection of Lovely Mechanical Clocks Will Add a Decorative Touch to Any Home or Office! Everyone experiences home decor drain, when they simply can’t look at their old furnishings any longer and they need to make a change. Again, people are fickle, and trends come and go as swiftly as a summer storm. 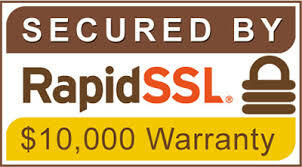 Many potential buyers are also feeling the effects of too many digital devices in their daily lives. Inundated with computers, smartphones, flat screen televisions and the like has made everyone resort to staring at nothing but screens. Despite advances in technology, seeing electronic devices taking over your home can be somewhat overwhelming. With all of these factors combining together to create an unsavory home environment, sometimes a person needs to look elsewhere to find quality home furnishings they’d be proud to show off. Thankfully, we have just the right solution for you! 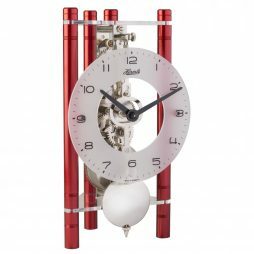 Investing in mechanical clocks is not only practical for keeping daily schedules on track, but the majority of our brand-name designs can be easily supplemented as decorative furnishings for your home as well. Searching for the perfect accessory (especially one that you’ve already idealized in your mind) can not only be hard to find, but hard to replicate exactly. However, our collection of top-quality, high-end products makes almost certain that you’ll discover something to match your needs. Want something that’s sophisticated and chic, yet understated enough to fit into a simplified, modern lifestyle of today? 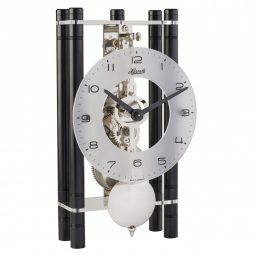 Go for something like the Kieninger Tourbillon Bells Mechanical Mantel Clock. This mechanical clock is intricately designed inside due to its tourbillon escapement and three-train movement. However, it’s not overly gaudy or heavily embellished for a cleaner, contemporary look that would appear respectable and fresh in your modern home. It’s ebony wood case and glass paneled sides are classy, and their placement allows you to visually see all of the clock’s inner movements. 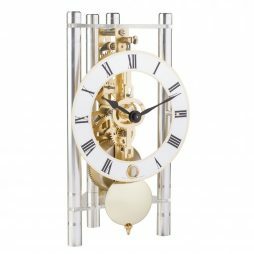 With its chiming feature ready to play some lilting melodies as well, this mechanical clock is certainly a keeper. 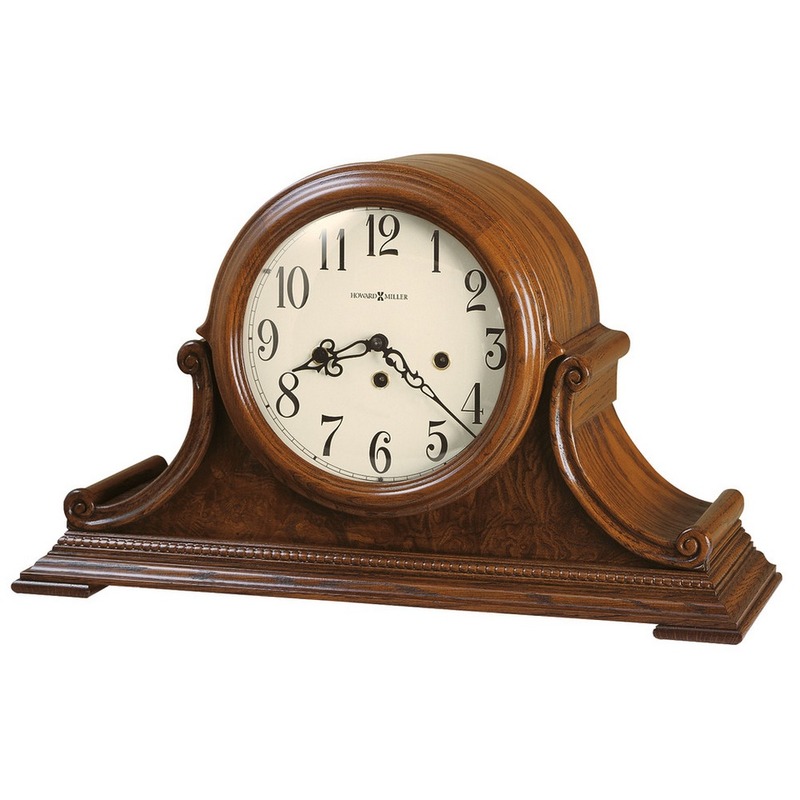 For an item with a bit more traditional styling and accents, look into a piece such as the Kieninger Rosewood Mechanical Mantel Clock. Made in Germany, this effortless timepiece has a delicate charm and character about it you can’t easily find anywhere else. 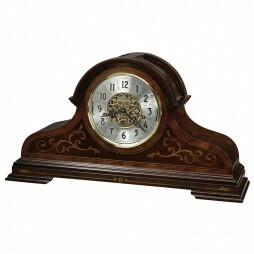 The filigree designs in the crown and base of the clock are beautifully-crafted, while the Rosewood veneer presents a natural, rustic exterior that enhances any design choices in the home. The small drawer holding the wind-up key is simply precious as well, making this timepiece and absolute delight for the home. Don’t feel like you’re giving up modern style by ridding yourself of some digital gadgets. Just accentuate your home with other contemporary stylings instead, like any of the mechanical clocks we have to offer at ClockShops.com! Mechanical clocks never truly went out of style, but the notion behind the classic ‘mantelpiece’ has lost some of its trendiness over the years (again, fallout from a newly digital age). 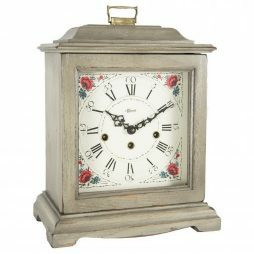 So bring back some of the sentimental charm missing in today’s home decor by investing in an authentic keywound mantel clock. 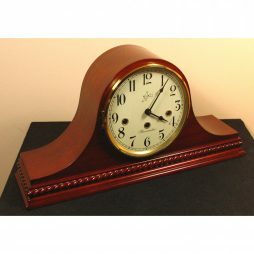 Set up your space with a true blast from the past, like the Howard Miller Barrett Keywound Mantel Clock. Designed with choice hardwoods and a Windsor Cherry finish, the front of this piece also displays olive ash burl overlays. The ornate silver-finish dial includes Arabic numerals and a brass-finished chapter ring, completing the timeless look of a mantelpiece from a bygone era. 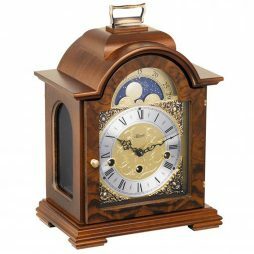 You can’t find anything classier than this Victorian-themed timekeeper, the Queensway Keywound Mechanical Mantel Clock with a Walnut finish. 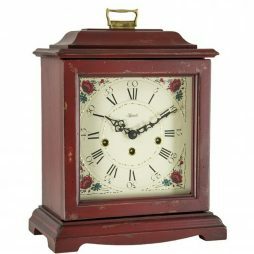 The red-brown finishes on the clock’s detailed frame add a lovely touch of natural color without being gaudy or out of place. The center clock dial supports golden hands and numbers on a glass bezel above a white background, which appears to glow as the metallic accents shine. 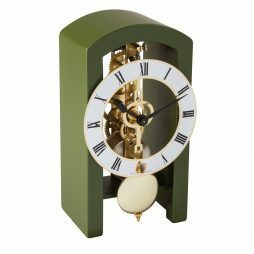 The clock’s delicate scrollwork is the true beauty of the piece, signifying the elegance and allure of a classier time. While you want to remain true to your modern style of furnishings, there’s nothing wrong with throwing in touches of vintage charm to offset it. Bring some character and imagination to your decor choices, and show off elements of your personality. After all, it’s your home; it should reflect who you are! So let us! 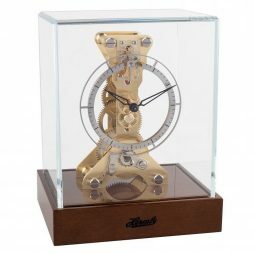 Browse through a varied selection of mechanical clocks and keywound mantel clocks on ClockShops.com to liven your home with timeless, effortless artistry and sophistication. In our digital world, it’s important to keep some traditions alive. 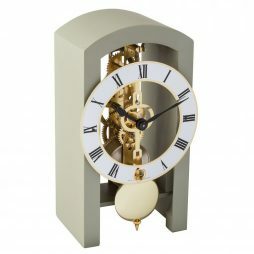 Elegant timepieces are a great way to decorate your home in stylish yet unique ways, so discover what you’ve been missing! Find your perfect clock today!